Brave the cold and come by the opening this Friday evening at 7p to talk shop and have a few drinks. 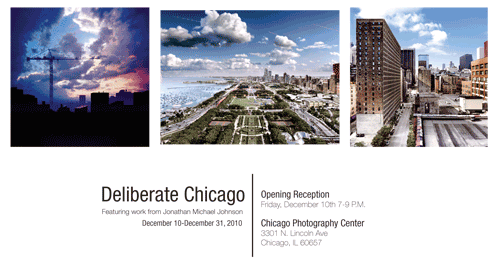 The Chicago Photo Center (where I've been teaching for the past few months) is hosting a solo exhibition of my work this Friday evening, December 10th, at 7p. The CPC gallery is a beautiful space and I'm excited to be working with them. If you've ever wanted to see my work large and up close - this is the opportunity. The evening will open with a short discussion about my process and a q/a session. Refreshments will be served. If you can't make the opening, no worries - the work will be up and on display through the month of December.